These solar panels were set up by Tesla at the San Juan Children’s Hospital after the island was hit by Hurricane Maria. Puerto Rico is in the midst of the worst electricity outage in U.S. history. Most of the island remains without power more than two months after Hurricane Maria hit the island. Some Puerto Ricans are saying that the current crisis should be a wake-up call that the island needs to move to a less centralized power system — and that solar power might be part of the solution. 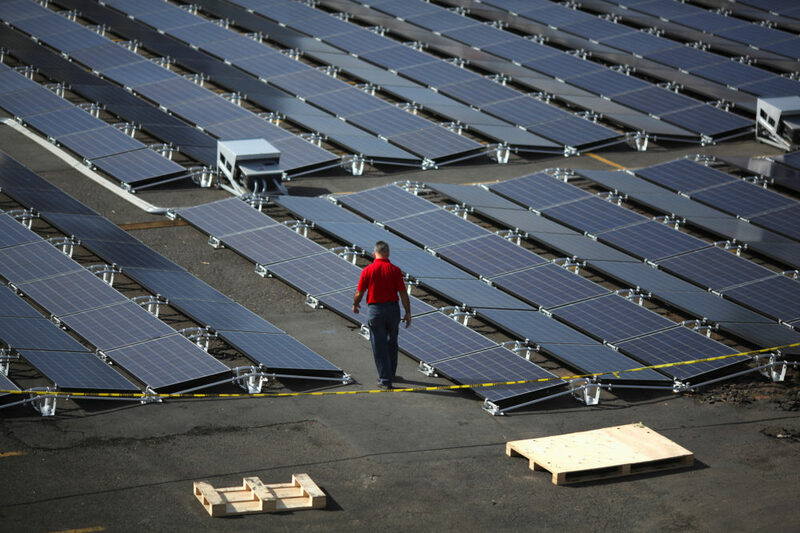 In other words, they believe Puerto Rico should follow the lead of many developing nations where solar power production is expanding rapidly. Despite being part of the United States, Puerto Rico has electrical woes similar to those facing deeply impoverished nations in Africa and Southeast Asia. Hurricane Maria, which hit Puerto Rico on September 20 as a Category 4 hurricane, caused the entire electric grid to collapse. But things weren’t exactly in good shape pre-Maria. The transmission lines and power plants of the Puerto Rico Electric Power Authority, also known as PREPA, were crumbling due to a lack of maintenance. The rates it charged were higher than any utility on the mainland, yet still PREPA was financially broke. This summer the power authority filed for bankruptcy after failing to make payments on part of its $9 billion in debts. “PREPA has failed,” says Arturo Massol Deyá, who lives in the small city of Adjuntas in the island’s mountainous interior. 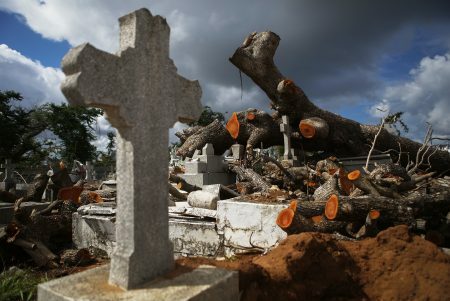 Weeks after Maria hit, most of the 20,000 residents of Adjuntas are still without electricity. “The only people that have power are the ones that own their own generators.But from the government … zero, nothing.” Massol is a professor of microbiology and ecology at the University of Puerto Rico at Mayaguez and is on the board of directors of Casa Pueblo, a nonprofit community group based in Adjuntas. And Massol is one of the islanders who still has power because he has solar panels. 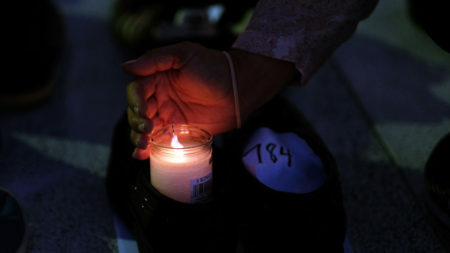 Massol and other activists from Casa Pueblo have been advocating for years for Puerto Rico to embrace alternative forms of energy. The group installed its first array of solar panels 18 years ago. Massol and others are saying Puerto Rico should use this disaster as an opportunity to move away from what Massol refers to as an “obsolete, corrupt model of power generation.” Currently utility crews, FEMA and the Puerto Rico government are frantically trying to re-string electric lines and get power back across the island. But that would be a huge shift for Puerto Rico. Prior to Hurricane Maria, Puerto Rico was getting only a tiny percentage of its electricity from solar.According to the U.S. Energy Information Administration only two percent of island’s power last year was coming from renewable energy sources of any kind. “The commonwealth has some renewable solar, wind, hydropower and biomass resources but relies primarily on imported fossil fuels to meet its energy needs,” the EIA states in its latest profile of Puerto Rico. Elon Musk the founder of Tesla suggested on Twitter in early October that his company could build an entirely new power system for the island based on solar panels and batteries. Rossello has publicly endorsed installing more solar panels across Puerto yet with most of the island still without power he’s also charging forward to rebuild the old electrical system much the way it was before. The new solar arrays that are getting installed are being put in piecemeal mainly as an alternative to diesel generators. Weeks after Elon Musk’s tweet, Tesla erected a 200 kilowatt solar array along with a battery storage system at a children’s hospital in Guaynabo, Puerto Ricom just outside of San Juan. “We’d been more than a month without electricity,” says Julianna Canino Rivera, the administrator of the hospital, looking out at the rows of solar panels covering what used to be the hospital staff parking lot. The hospital provides 24-hour residential care to 35 kids. It also offers inpatient and outpatient medical services for children.The hospital has two diesel generators and was alternating between them to keep the lights on. She was worried, however, that one of the generators might just break down completely. The solar-powered system now covers the hospital’s electricity needs for 20 hours a day. Globally solar power generation capacity is booming but the largest expansion has been outside of the Global North. China is investing more in photovoltaics than any other nation in the world. 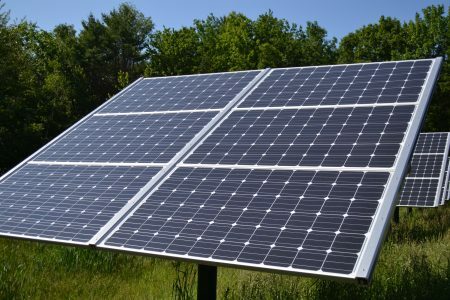 And according to the Renewable Energy Policy Network for the 21st Century, over the course of 2016 China boosted the amount of electricity it gets from photovoltaic cells by 45 percent. South Africa is investing heavily in solar power. Barbados leads the world in solar hot water production on a per capita basis. Many countries in Africa have found it easier to expand access to electricity with relatively small solar farms as opposed to running more lines out of what are often overburdened fossil fuel burning plants. “In some places like Ghana we actually put a [solar] system in that was parallel to an existing grid because the existing grid is not reliable and costs too much,” says Bryan Quinn, an electrical engineer from the University of Maryland.Quinn has worked with several non-profit groups designing and installing solar power systems in Africa. He says small, self-contained micro-grids can be a highly efficient way to expand access to electricity. He says smaller solar-powered systems can allow developing countries to leapfrog the cumbersome and daunting process of building nationwide electric grids that are dependent on huge power plants. And he says that in a lot of developing countries that’s already happening. And at the Children’s Hospital in Guaynabo, Puerto Rico, Julianna Canino Rivera says that in the midst of her island’s ongoing power outage solar panels are not only a lot quieter than her diesel generators they’re more reliable.